The left manus ("hand", at top) and left pes ("foot", bottom) of the UCMP's treasured original specimen of Dilophosaurus wetherilli. The black and white scale bars are 10 centimeters (4 inches) long. Let's take a brief break from Sam Welles' entertaining narration to get more familiar with Dilophosaurus wetherilli. According to the current taxonomy of the carnivorous theropod dinosaurs, of which Dilophosaurus is undoubtedly a member, Dilophosaurus is considered to be a ceratosaur (Ceratosauria includes the Coelophysoidea and Neoceratosauria), though its position within the group is uncertain. If you look closely at the manus (hand) and pes (foot) of the original specimen of Dilophosaurus, you'll see that the manus has four digits (the fourth digit is vestigial, or reduced), and the pes has three digits. Actually, we know from other specimens of Dilophosaurus that it had a fourth and fifth digit on each pes, but these are extremely reduced, and were not preserved in the holotype specimen. The four-fingered manus is characteristic of many ceratosaurs. 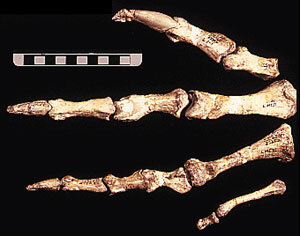 The first digit of the manus (uppermost one in the picture above) was apparently opposable against the others, allowing for a grasping function. 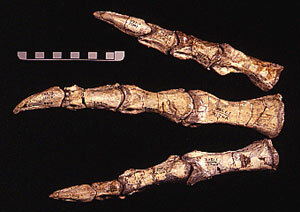 The pes is a very typical theropod pes; note that the middle digit (digit III) is the longest of the three digits. The skull of Dilophosaurus tells us the most about the animal's relationship to other ceratosaurian theropods. 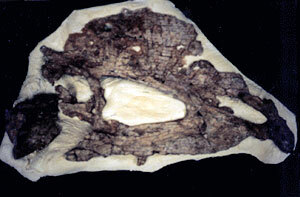 It is pictured at left  the front of the snout is to your right; the top of the skull is at the top of the picture. You are looking at the right side of the best-preserved skull of Dilophosaurus; as Sam Welles will tell you, the holotype specimen did not have a complete skull, while a later find had this beautifully preserved skull that revealed to Sam that this was a new type of dinosaur. The dentary (lower jaw) is not present in the image. Now look closely at the skull. The premaxilla (at the tip of the snout) is loosely attached to the maxilla (to the left of the premaxilla; it is the primary tooth-bearing bone of the upper jaw). This is a diagnostic characteristic of most ceratosaurs. Sam will tell you more about the way it might have worked in the living animal. Sculptor Michael Trcic's bronze Dilophosaurus outside the Mesa Southwest Museum, Mesa, AZ. Photo © Geb Bennett. Also note the thin crest on the top of the skull; this immediately showed Sam Welles that he had discovered a previously unknown theropod dinosaur. Dilophosaurus wetherilli was a fairly large ceratosaur; about six meters (20 feet) long, and quite slender. It is not the largest or most well-studied ceratosaur, but it is represented by some of the most complete specimens of any known ceratosaur, and with good preservation (considering their 150-odd million years of age). UCMP is very proud of its wonderful and unique specimens of Dilophosaurus. Continue your lecture with Sam Welles to learn about Dilophosaurus habits, or delve into the UCMP's extensive exhibits on theropod dinosaurs to learn more about Ceratosauria. Welles, S.P. 1954. New Jurassic dinosaur from the Kayenta Formation of Arizona. Bulletin of the Geological Society of America 65:591-598. This is the first published description of what Sam Welles originally called Megalosaurus wetherilli. Welles, S.P. 1970. Dilophosaurus (Reptilia: Saurischia), a new name for a dinosaur. Journal of Paleontology 44:200. This short note established the new name for Dilophosaurus, after the discovery of the crests on the skull in 1964 proved that this dinosaur was not Megalosaurus but something quite new.